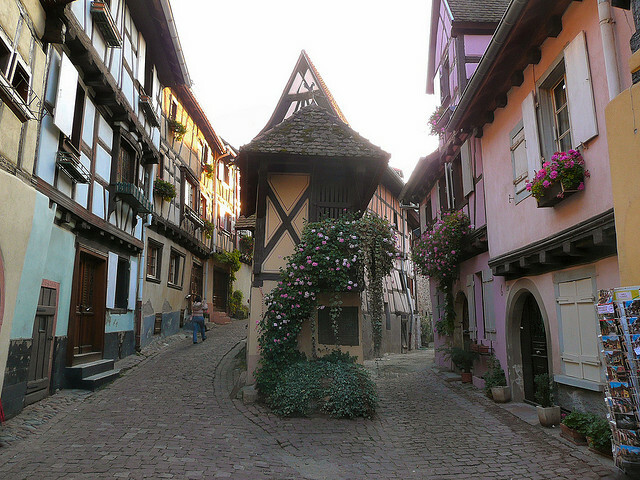 However, sometimes a secret can slip out and that is quite possibly the case with Eguisheim. 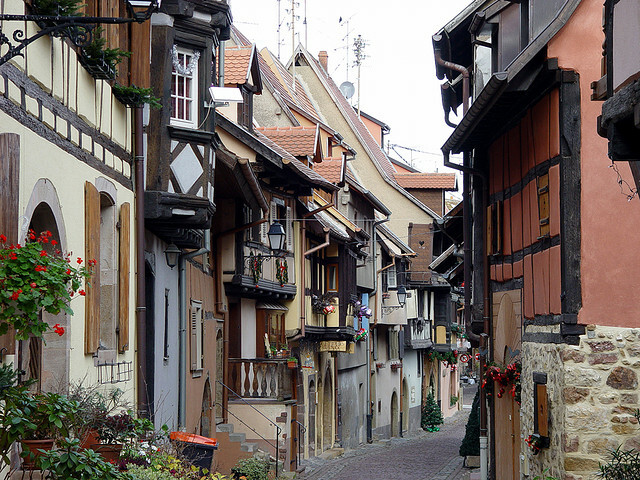 Its tourists are overwhelmingly French or from the neighboring countries of Germany and Switzerland. 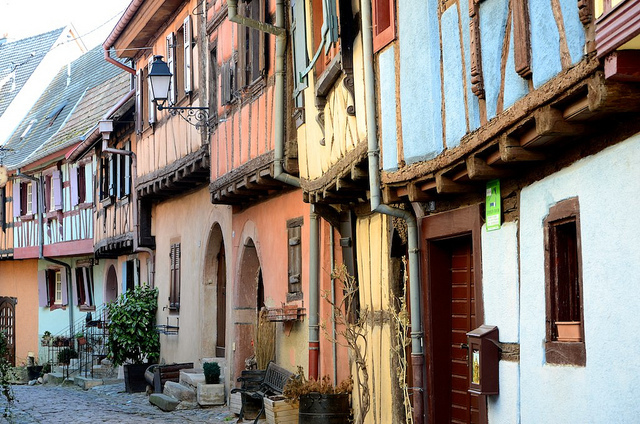 With the success of the recent vote, France’s newest favorite village (an award given each year) may see many more languages spoken along its historic streets. 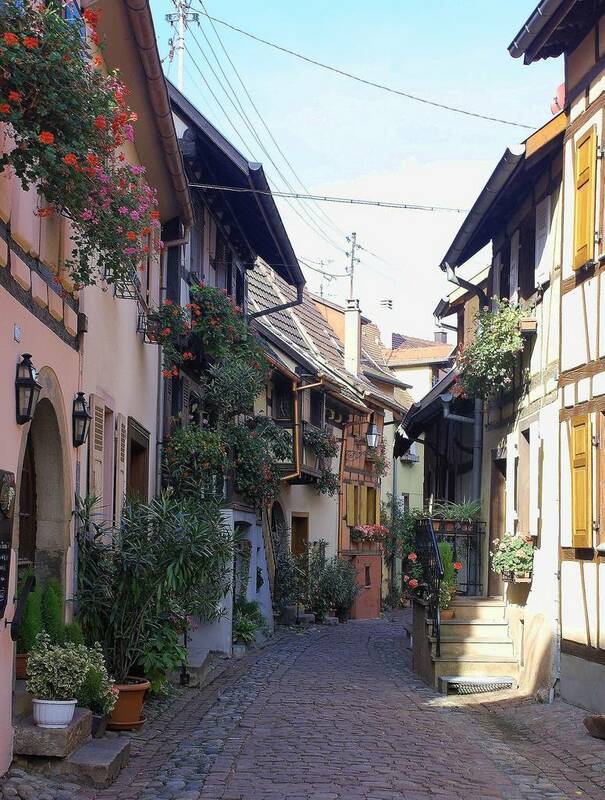 Eguisheim was the place where the famous Alsace industry of viticulture all began. Its micro-climate is perfect for winegrowing. 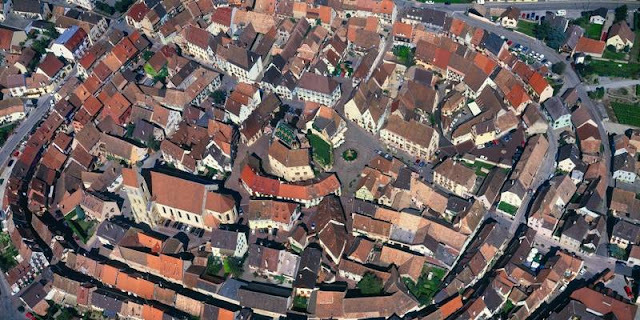 The village, cradle of the Alsatian vineyards, wraps around itself protectively (it was fortified as far back as 1257), its multicolored houses creating a small, concentric but beautiful maze. 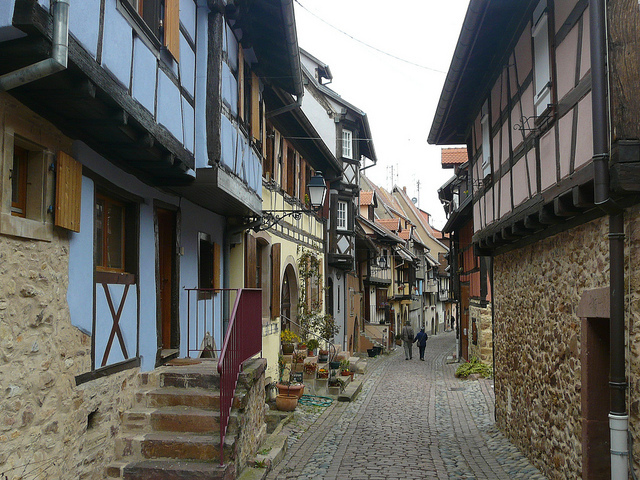 If the houses have a somewhat Germanic look to them then it is because the department of Haut Rhin (in which the village lies) has a mixed cultural heritage. 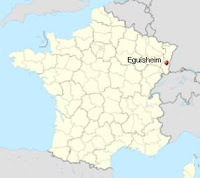 Although it is one of the original 83 French departments created in 1790 during the French Revolution it has twice been annexed by Germany, from 1871to 1919 and for four no doubt bleak years during the Second World War. 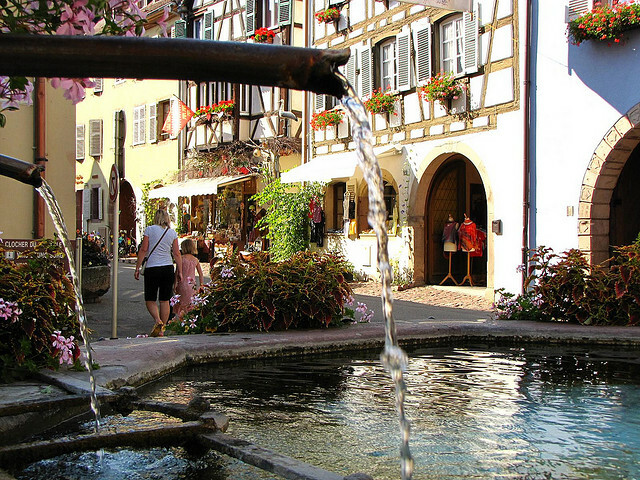 The neighbors have since become the best of friends and Eguisheim welcomes many German visitors each year. 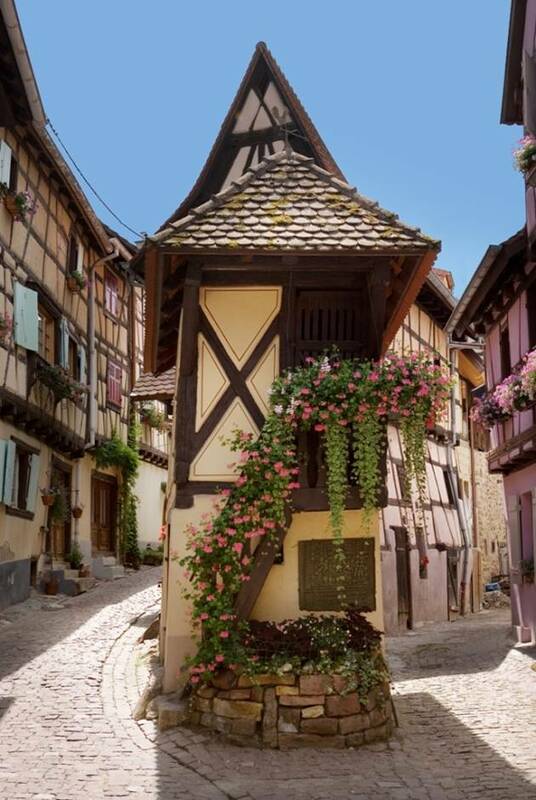 It’s a beautifully preserved village, one in which the traveler can just stand and look (I think the verb I would use for myself is gawp). The eighth century castle may be visited accompanied by a guided tour but the rest of the village can be seen on foot and on your own. There is the Saint Peter and Saint Paul Church, which dates from 1220. 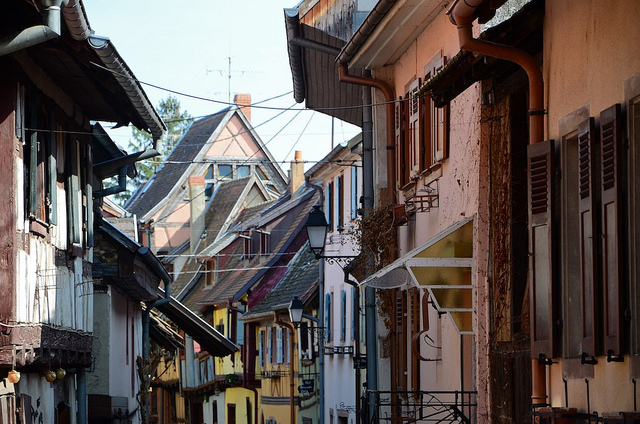 Then, bien sûr, there are the narrow streets replete with their balconies, bow-windows and pointed gables which were built around military ramparts dating from the 1400s through which visitors may meander. 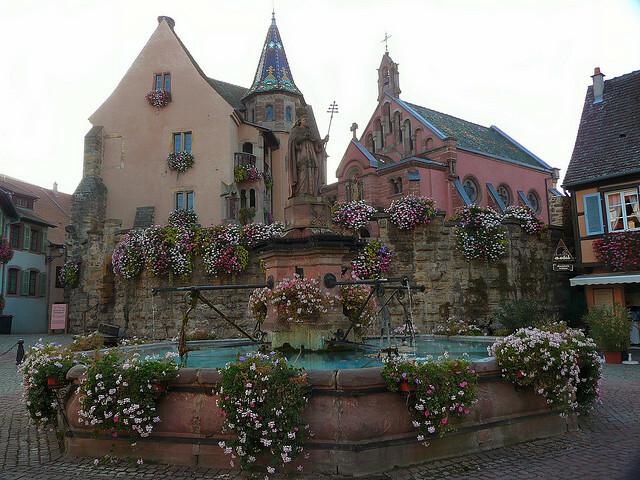 Eguisheim is a village of fountains. There are four altogether, with the oldest being the Market Square fountain (which was built in 1557), another from the same century and two more from the middle of the nineteenth. 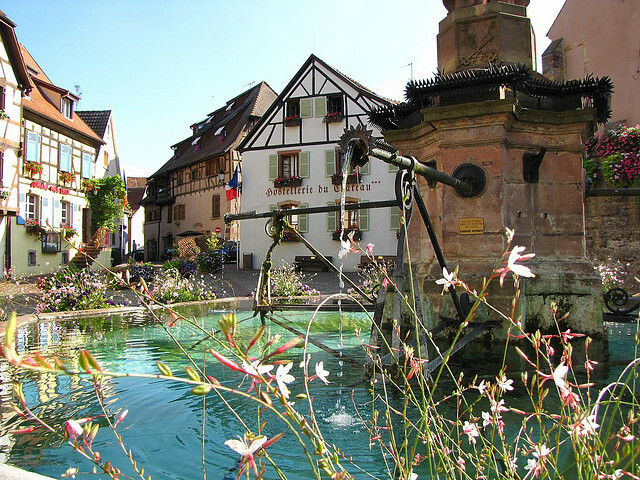 Water has played such an important part in the local winegrowing economy that fountains must have seemed a perfect way in which to celebrate the village’s success: ab aqua ad vinum. So much, so sleepy, the perfect place to go and do nothing but look and smile and eat and then repeat in any desired order. Yes. 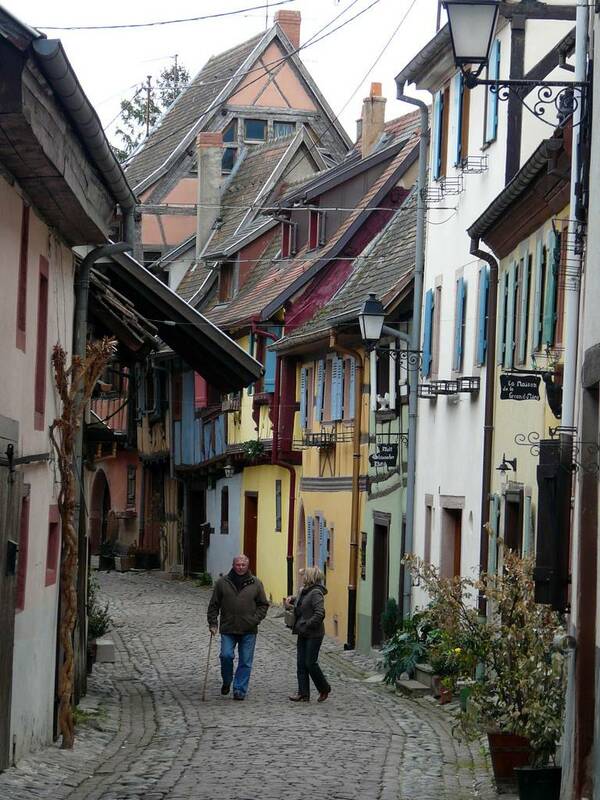 However, for a village of only 1500 or so souls there is an awful lot which goes on in Eguisheim. There are a variety of festivals celebrated in the village, many of which are focused on flowers. This means that the village appears to be in full, radiant bloom for much of the year. Don't forget Easter and Christmas too with their own special celebrations. 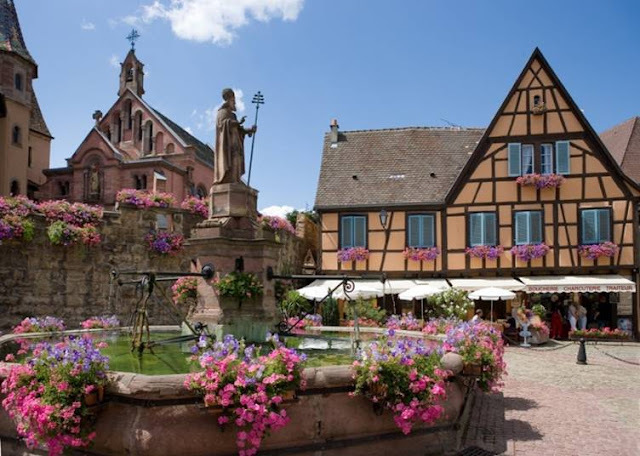 In Eguisheim there are also plenty of restaurants in which to savor wonderful provincial dishes: remember the French think theirs is the best food in the world - because it is. 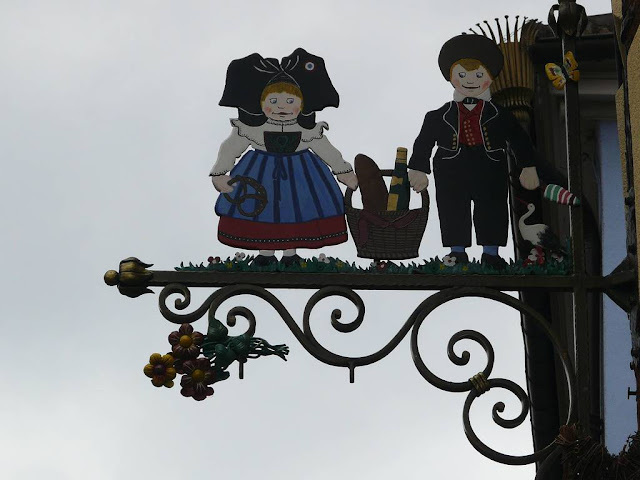 Then there is the Fête des Vignerons on the last week in August where all the local winegrowers come together in the village to celebrate. 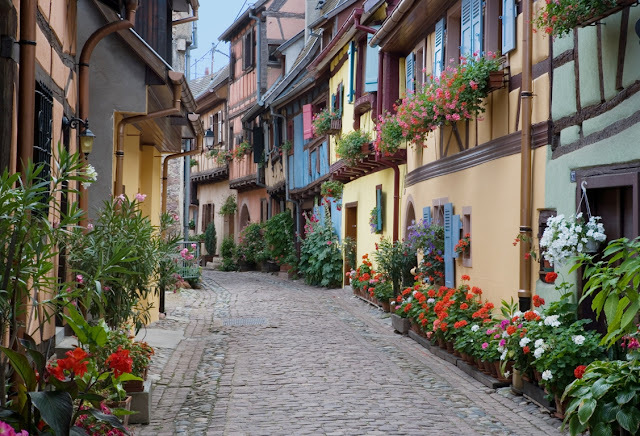 Eguisheim is a village savvy enough to be commercial but sensible enough to know that culture, heritage and environment are equally important and are what keeps it special. 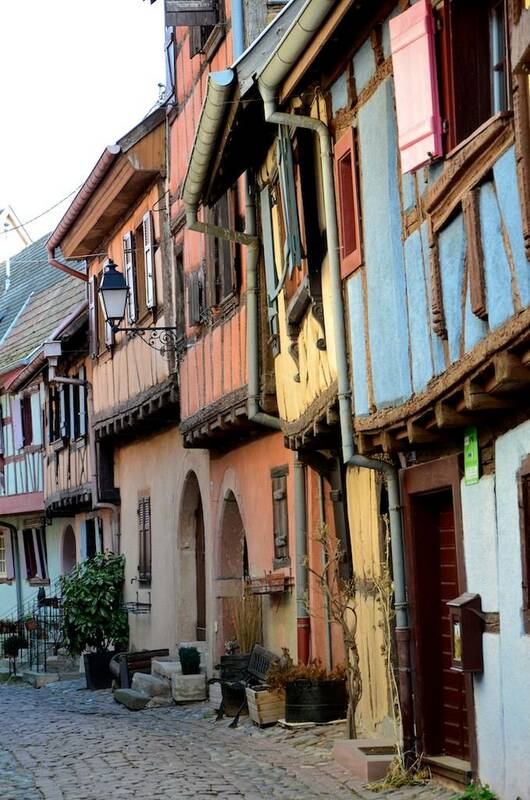 As the village settles in to its honoured, yearlong title of Village Préféré des Français I suspect that it may become the favorite destination of a number of other nationalities too. Oh, and did I tell you it has storks, too? 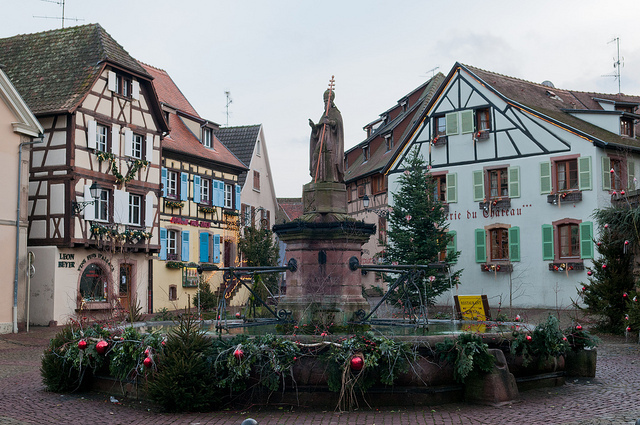 Kuriositas would like to thank Caroline Meyer of the Eguisheim and Environs Office of Tourism for providing us with some of the marvelous photographs you see here.